Dr. Sean Logie is a Pediatric Psychologist at Mt. Washington Pediatric Hospital in Baltimore, Maryland. Dr. Logie practices in the hospital’s Feeding Disorders Clinic and is part of an interdisciplinary team of health professionals that evaluates and treats children with a wide range of feeding problems. Dr. Logie, in collaboration with oral motor therapists, also runs a multi-family group therapy program designed to treat severe food selectivity in children. 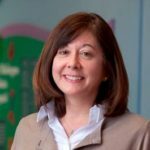 Dr. Logie received a Bachelor of Arts degree from Loyola University Maryland in Fine Arts, a Master of Arts in Teaching from Johns Hopkins University, and a Doctor of Philosophy in Clinical Psychology from University of Maryland, Baltimore County. Dr. Logie has presented on Treating Food Selectivity in Children with Autism Spectrum Disorder. Ellen Wingert is the Manager of the Feeding Day Treatment Program at Mt. Washington Pediatric Hospital in Baltimore, Maryland. She has a background in Occupational Therapy and has over 30 years of clinical experience, her specialty and interest areas being complex feeding disorders. Ellen received her Bachelor of Science degree in Biology from Millikin University, in Decatur, Illinois, followed by a second Bachelor of Science in Occupational Therapy from Washington University in St. Louis, Missouri. Ms. Wingert has published on this topic and has also presented at several regional conferences. 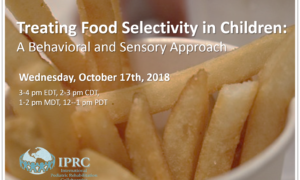 Identify strategies to maximize caregiver/family participation and understanding of selective feeding disorders. Please follow the link to view the or copy the link below into your browser. Please submit your name and email to view the recording.